It’s been too long since my last post. Once Thanksgiving hit, the last few months of 2009 were just a whirlwind. I must say this holiday season was an exceptionally good one. The food was phenomenal and the family time was really special. The joy of having a large family is the multiple events to attend. Of course that means more holiday food! I ate enough casseroles and desserts to last me through 2010. With all of the delicious calorific food that was consumed my waist line was not happy with the end result. But what is a girl to do when tempted with such deliciousness?!?! Well, my heavy appetite has yet to subside and the freezing cold weather that Dallas has been seeing has yet to pull me out of hibernation mode. So, now is when I turn to my favorite magazine for scrumptious and healthy good eats…Cooking Light. I can’t say enough good things about this publication…and lovely website as well. Not only do they offer great cooking techniques but the food is healthy and truly delicious. Since we are in the new year I thought it would be appropriate to share with you my favorite comfort food but with a healthy twist. No, I did not make a health induced resolution this year, but after the over indulgence that was Thanksgiving and Christmas, it is time to get back on track. I love carbs, especially pasta, so any way that I can make it healthier but still enjoyable to eat I am all for. Lasagna is the ultimate comfort food but all that cheese and meat can really crank up your daily caloric intake. This recipe is definitely in my top 5 from Cooking Light. I stumbled upon this while trying to find a healthy alternative to my favorite Lasagna, Chicken and Mushroom Lasagna from Patrizio. It satisfies my need for a classic comfort food with all the creamy and cheesy goodness, and it’s really not too terrible for you. So give it a try, you’ll love it! **Addition – Buy a rotisserie chicken, take the meat off the bone and shred the chicken, then mix the chicken into the mushroom filling. It just adds that extra level of comfort and flavor!! **Tip – Porcini and Shiitake mushrooms can be very pricey, you can make this with all cremini and it’s just as delicious. 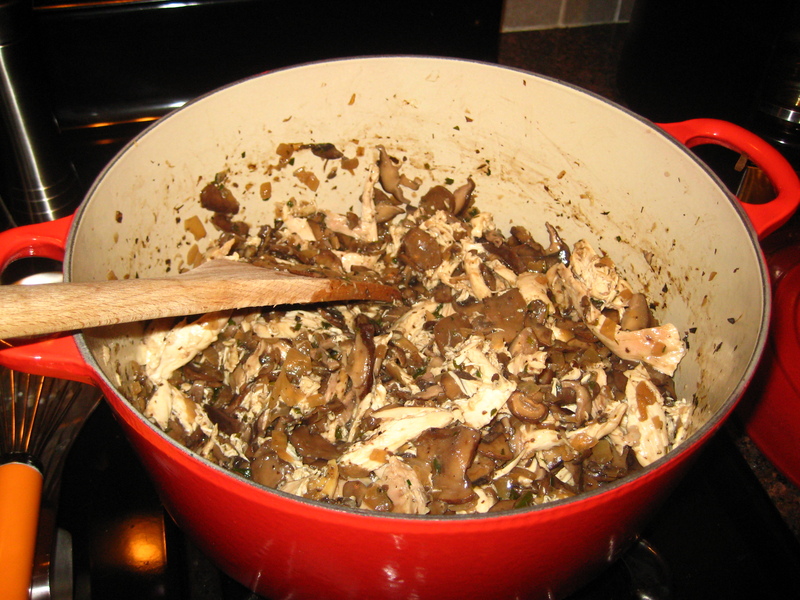 I usually forgo the Porcini mushrooms (add a bit of chicken stock in place of the porcini liquid), reduce the shiitake to about a pound, and replace with additional cremini mushrooms. Either way will work and won’t sacrifice the taste of the dish. **Tip – I’m partial to using old school lasagna noodles that you have to boil. 🙂 I’ve had mixed results using precooked lasagna noodles, they usually turn out a bit tough. Either way is delish! To prepare filling, combine water and porcini in a small bowl; let stand 30 minutes. Drain porcini through a sieve over a bowl, squeezing porcini to extract liquid. Reserve 1 1/2 cups liquid; discard remaining liquid. Rinse porcini, and drain. Chop coarsely; set aside. Heat oil in a large Dutch oven over medium-high heat. Add onion; sauté 5 minutes or until tender. Add garlic; sauté 30 seconds. Add shiitake mushrooms, cremini mushrooms, and 1/2 teaspoon salt. Sauté 5 minutes or until mushrooms release moisture and begin to brown. 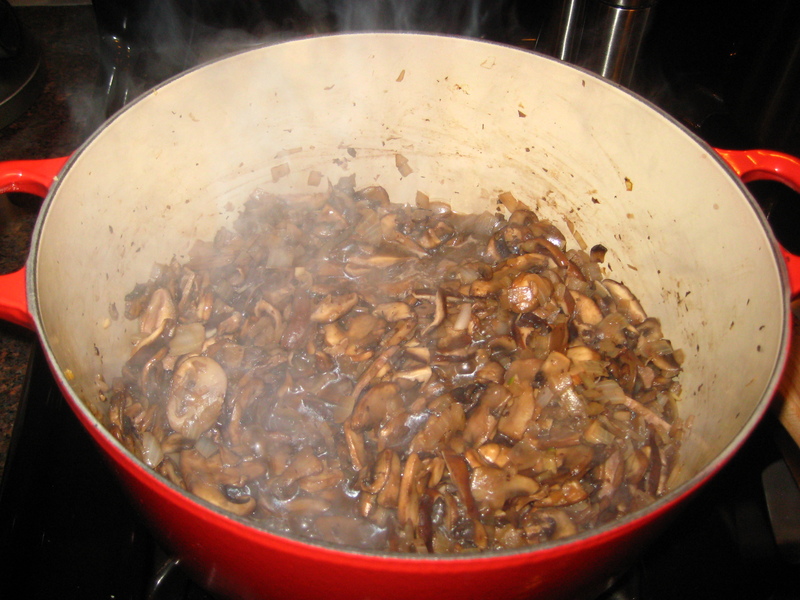 Stir in porcini, wine, and soy sauce. Cook 4 minutes or until liquid almost evaporates, stirring frequently. Stir in parsley and rosemary. Add the reserved porcini liquid; bring to a simmer. Cook until liquid is reduced to 3/4 cup (about 10 minutes). Remove from heat; stir in 1/4 teaspoon pepper. To prepare béchamel, place milk in a 4-cup glass measure. Microwave at HIGH 3 minutes or until hot, stirring after 2 minutes. 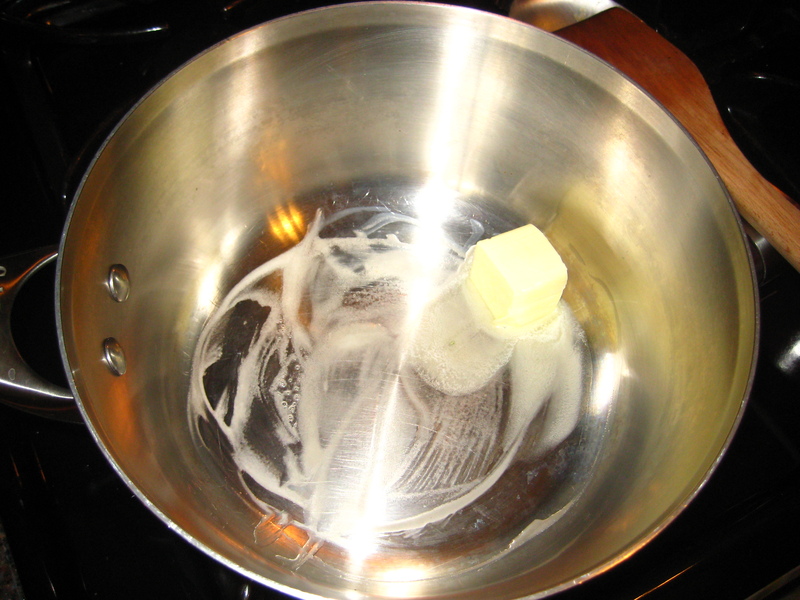 Melt butter in a large, heavy saucepan over medium heat. 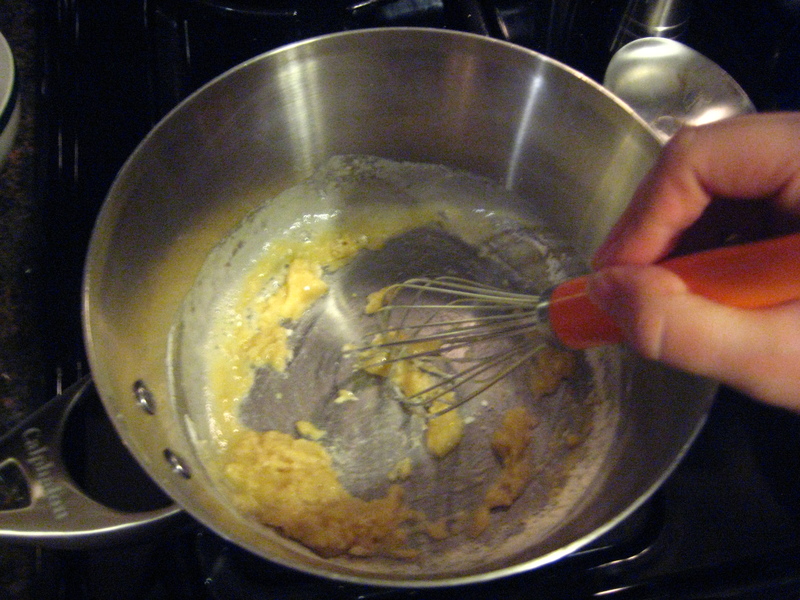 Add flour, stirring with a whisk, and cook 1 minute or until bubbly, stirring constantly. 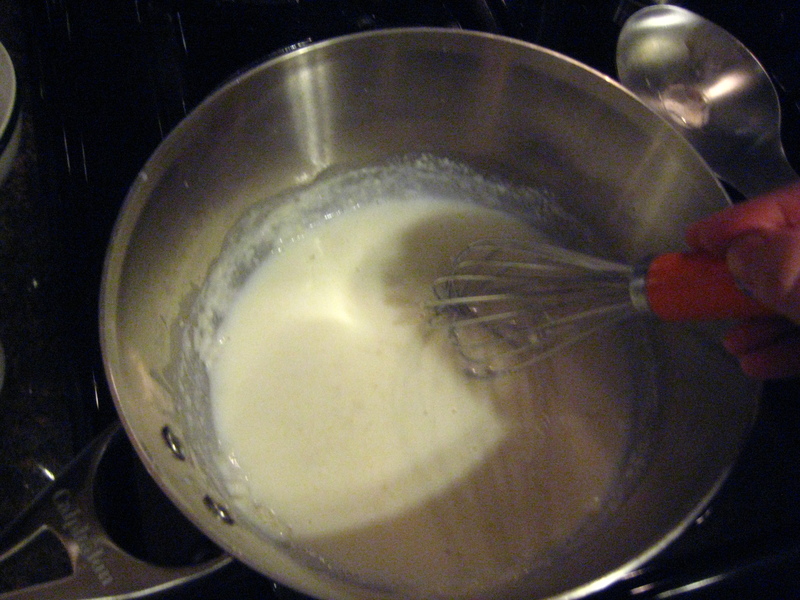 Gradually add milk, stirring constantly with a whisk. Bring to a simmer; cook over low heat 8 minutes or until sauce slightly thickens, stirring frequently. Remove from heat, and stir in 1/2 teaspoon salt, 1/4 teaspoon pepper, and nutmeg. Spread 1/2 cup béchamel in bottom of an 11 x 7-inch baking dish coated with cooking spray. 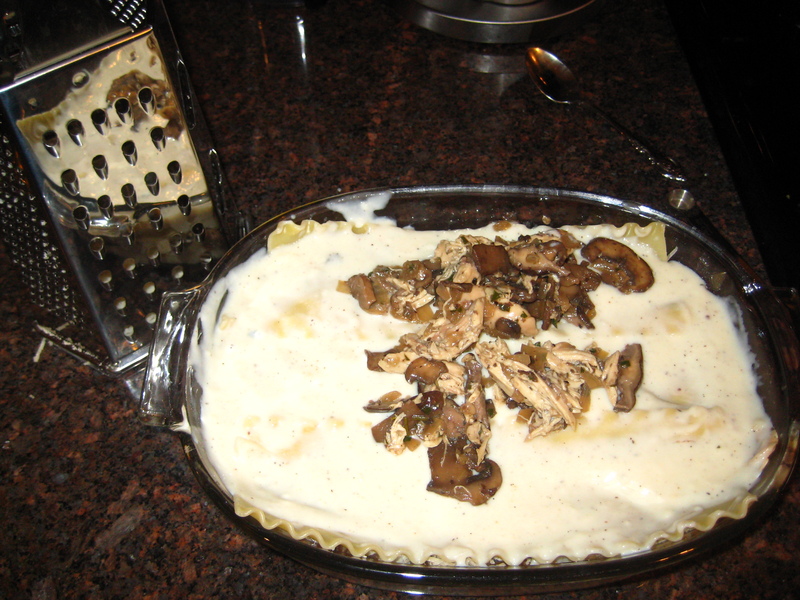 Arrange 3 noodles over béchamel; top with 1/2 cup béchamel. Top with 1 cup mushroom mixture. Sprinkle with 1/4 cup cheese. Repeat layers three times (dish will be very full). Cover with foil; place baking dish on a baking sheet. Bake at 350° for 30 minutes. Uncover lasagna; bake an additional 15 minutes or until cheese melts. 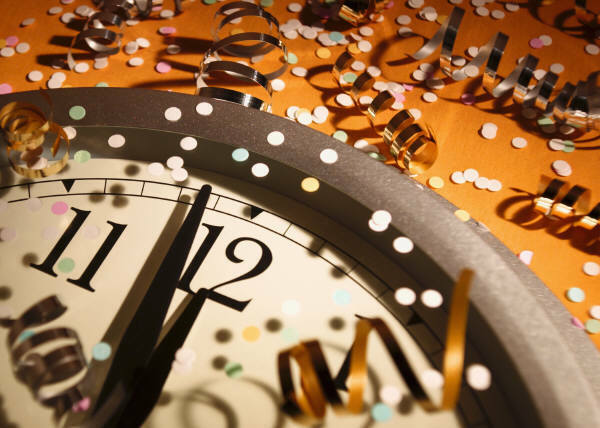 What better way to bring in the new year with a fun song to get you ready to take on 2010! Crank it up and start your year off right. Cheers! « Thanksgiving means Squash Casserole!!! Love this song by Black Eyed Peas! I agree with your opinion about Cooking Light. I used their recipe for cranberry cosmopolitans yesterday and tuna noodle casserole tonight. 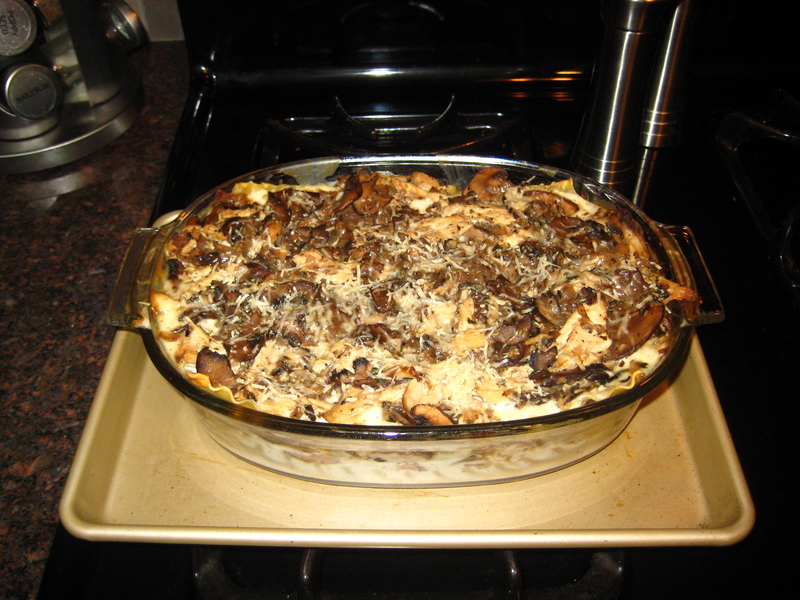 The mushroom lasagna looks yummy! It’s delicious!! I haven’t made a bad recipe from them. Thanks for the tip. We’ll make this, but will use low carb pasta. Still don’t see the tip for a Holiday Hangover, lol…I will say a Cotes Du Rhone leaves me with little to no hangover if I overindulge (once in a while). Enjoyed your song, “What’s it Like”, and next time I visit Portland to see my friend, Gleason, I’ll think of that song. Thanks!